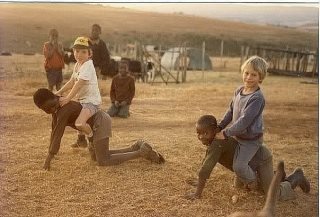 AFRICANGLOBE – Hundreds of thousands of White settlers left South Africa following the ANC‘s landslide election victory in 1994. Twenty years on, the exodus shows signs of slowing, even reversing. Jane Flanagan spoke to some of those who have returned. Nicky and Craig Irving spent five years in Australia before moving back to Cape Town with their three daughters. They were among the last members of their respective families to emigrate amid fears over the crime wave that swept South Africa during the 1990s. “The challenge to us from our relatives who had left was ‘How can you raise your children in a country that is so violent and has no future’,” Mrs Irving recalls. The Irvings were among 44,500 White settlers who left the country in 2004, more than double the annual figure in 1996. But after five years in Sydney and on a farm five hours drive from the city, the Irvings had had “enough of living in a sorted society”. Mrs Irving, an architect, is now working with Cape Town officials to help improve Khayelitsha, the country’s biggest township. Someone who also left in the first wave, Angel Jones, was prompted to return on hearing Nelson Mandela reach out to a mainly White South African crowd on a visit to London in 1996. “He told us: ‘I love you so much. I want to put you in my pocket and take you home’,” she recalls. She came home in 1996, just as many of her friends were packing their bags to leave, and set up Homecoming Revolution which connects the homesick South African diaspora with potential employers back home. The exodus has steadily slowed however and there is evidence that many of those that left – whether for careers, over safety fears or political instability – are returning. Homecoming Revolution estimates that some 340,000 have come home in the last decade. The idea that the “pale male” is not welcome in the South Africa, in the wake of a widespread implementation of affirmative action, is misplaced, Ms Jones says. There is “no shortage” of opportunities for returning skilled professionals with international experience, particularly in finance and IT, she says. But settling back into life in South Africa often takes time and some cannot put aside their original motivations for going. Around one in six returnees end up leaving again. After 12 years in London, Greg Anderson, now 45, could not contemplate the idea of returning to South Africa. However, the birth of his twin sons changed that, he says. He and his South African wife came home in 2008, and now have a third child. “It wasn’t just that the cost of childcare or the complicated logistics of having kids in a city,” Mr Anderson says. “To begin with, it was great to catch up with family and friends and enjoy the weather, but it took me a while to adjust to being back and I still miss London terribly,” he says. Lifestyle is one of the top three reasons given by White settlers for deciding to go back to South African, along with family connections and “a sense of belonging”, according to Homecoming Revolution research. For the 85% who do successfully reintegrate, there are certain aspects of life back home that perhaps only those who have left and returned can appreciate. Ms Jones describes it as a “genuine feeling of being alive” that South Africans do not experience in new lives overseas, whether it is Britain, Australia or New Zealand. “It’s a trade-off to come back to South Africa and it is natural that people have very mixed feelings about it. In the end, the decision to come home is an emotional one. Kerry Sinclaire agrees. Just seven months after returning to Johannesburg, she appreciates how easy it is to make a positive impact. “There are so many opportunities to be involved in other people’s lives in South Africa in a way that you don’t find anywhere else,” she enthuses. However, returning to a country where poverty, corruption and crime are rife has not been without its challenges for Mrs Sinclaire after six comfortable years in London. “It has been hard at times,” Mrs Sinclaire, 39, admits. “It’s not easy to open a newspaper or hear about what’s going on in South Africa, we have been sheltered from it. The Sinclaires were one of four young South African families in their south London circle of friends who all returned within a few months of each other. “It feels a very exciting place to be coming back to and also an exciting time for the country. We want to be part of the change that’s happening in South Africa – part of the solution, not the problem,” she says.